Shop AMS Songwriter Pack Recording Accessories Package from AMS with 0% Interest Payment Plans and Free Shipping. The AMS Songwriter Recording Package contains the accessories you need, when inspirations strikes, to lay down the perfect track. The AMS Songwriter package is perfect for the artist that already owns or has picked out a recording medium to easily fill out the rest of their recording chain. The centerpiece of this package is the Audio-Technica AT2020 condenser microphone. The AT2020 has proven itself in countless applications from vocals and guitar to piano and drums. 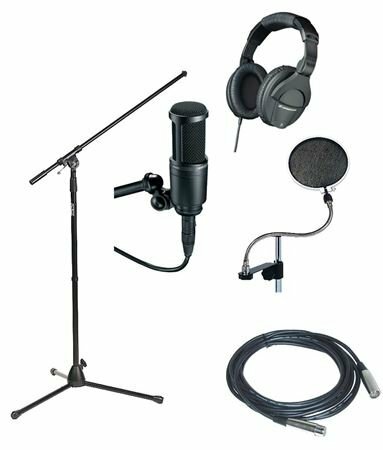 Also included in the AMS Songwriter Package is a pair of Shure Professional Headphones, an On Stage 7701B tripod microphone stand, a 18.5-foot CBI microphone cable, and a Stoppit microphone pop filter. Phone: 800-458-4076 Warranty: 45-Day Money Back Guarantee. All full manufacturer warranties apply. I love this bundle pack so much! This bundle pack is perfect for any artist. Highly suggest get this. Love my new setup! Great quality. Most times when I see a package like this there is no real price savings, but all together this is a great package and price that is truly a group discount. Well worth it, a great low-priced addition to my home studio. It's the best recording equipment I've seen so far the mic looks and sounds on point the headphone seem awesome from the picture I would love to own this!